How Do I Know If I Am Suffering From Menopausal Mood Swings? As one of the emotional symptoms of menopause, mood swings can leave you feeling upset, frustrated, and depressed. Over time, mood swings may start to impact your career, your relationships, and your self-esteem. You might feel constantly on-edge and unsure what could trigger your next episode. How can you tell when these feelings of sadness, irritability, and anxiety become a sign of something more serious? Read on to find out. What's to Blame for My Mood Swings? Mood swings are caused by erratic hormone levels, namely an imbalance between the hormones estrogen and progesterone. These two hormones work to produce the neurotransmitter serotonin. It is responsible for regulating mood by increasing serotonin receptor sensitivity and increasing serotonin receptor levels. When hormone levels drop, so do serotonin levels. When mood swings interfere with your ability to function in everyday life, they are often a sign of a serious psychological condition. It's important to note behavioral patterns: if you have inflated self-esteem one day, but low self-esteem the next, or if you have unusually high energy followed by a period of lackluster interest, you could be suffering from bipolar disorder. It's normal to feel sensitive or have a quick outburst, but it's abnormal when mood swings become the rule rather than the exception. Extended periods of insomnia, irritability or inability to concentrate are indicators that you are experiencing bipolar disorder, depression, or anxiety. If you have constant feelings of inadequacy or thoughts of suicide, you may be diagnosed with clinical depression by a healthcare professional. Additionally, if you make threats to others during bouts of mania, you may be diagnosed with bipolar disorder. If you or someone you know is experiencing these symptoms, you should consult with a healthcare professional immediately to be sure that you are keeping yourself and others safe. Psychological disorders like bipolar disorder, depression, and anxiety produce emotional side effects that should not be taken lightly. Understanding these conditions and how they are interfering with your everyday life is the first step to getting the help you need. 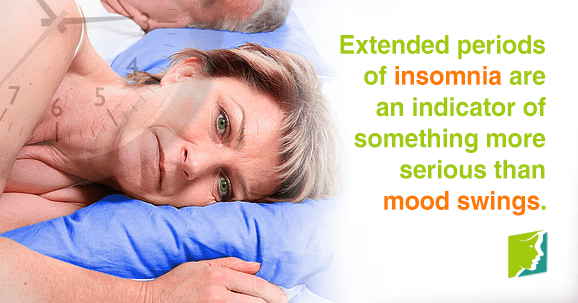 Click here to read more about extreme cases of mood swings. Amin, Zenab, Turhan Canli, and C. Neill Epperson. "Effects of Estrogen-Serotonin Interactions on Mood and Cognition". Behav Cogn Neurosci Rev 2005; 4; 43. Dr. Love, Susan, and Karen Lindsey. Dr. Susan Love's Menopause and Hormone Book. New York: Three Rivers Press, 2003. Molecular Psychiatry.(n.d). "Estrogen Promotes Gender Difference in Brain's Response to Stress". Retrieved from www.psycheducation.org. The Health Center.(n.d). "Adult Mood Swings".Retrieved from www.thehealthcenter.info. Mood swings and irritability can be managed in a variety of ways. Read on to learn more about what causess these menopause symptoms. Almost all women will experience mood swings at some point. The intensity and frequency of the symptom however, will vary. You've lost all control of your moods? Discover 3 simple tips that should have you on the road to emotional balance in no time.